Perfect for Jazz, Rock, and Pop Playing! 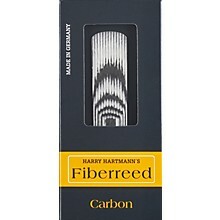 The Harry Hartmann Carbon Series Fiberreeds use high-tech carbon fiber with hollow connecting fiber. The interweaving of the different fibers results in a very true feeling reed. The weave of the fibers is designed to emulate natural cane in ways that no other synthetic reed can. The Carbon fiberreeds reproduce the tendencies of natural cane to be very strong towards the outside (the bark) and more resonant yet not soft at the heart, while being very flexible at the vamp. The result is a very full sound with direct response and a beaming upper register. The top choice of pop and jazz musicians.